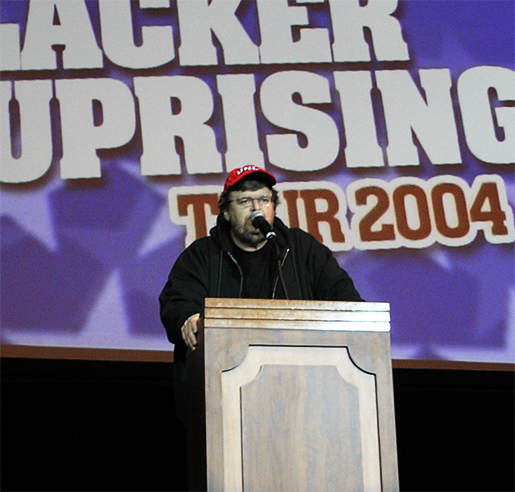 On the night before the 2004 presidential election, Michael Moore spoke with ferocity and vigor at the final round of his five-week Slacker Uprising tour across the country and visiting sixty cities. Despite being outnumbered by an enthusiastic crowd of Kerry supporters, many Bush pushers chanted “4 more years” voluminously. It was like a bad omen of things to come. New Orleans citizens abandoned for days in the Katrina flood. Nearly 4200 US soldiers dead in Iraq. Thousands of innocent Iraqi citizens tortured and killed. A damning deficit and a broken economy. You know the drill. What’s done is done. Four years after, we have another roll of the dice. Some remember Bush’s second win back in 2004, his first legitimate one, and wondered if we’d still be alive next year. R.E.M. 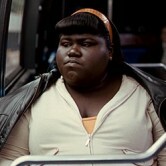 : “It’s The End of the World As We Know It”. It felt something like that. From the beginning of 2003, I discovered Michael Moore through his stinging documentary/political thesis Bowling For Columbine, which won the Academy Award. I sympathized with Moore’s views and followed up on his work. At the time I worked on tiling roofs, I remember after reading Dude, Where’s My Country? over the weekend in its entirety, I missed out on a Michael Moore signing at the same Chapters (the Canadian version of Borders) the day after I bought the book. The next year, I had seen all of his films, TV shows – TV Nation and The Awful Truth – and read all his books including the elusive copy Adventures in a TV Nation. Having followed Moore’s exploits closely, visiting his website weekly, watching Slacker Uprising now was like catching up with an old sitcom I was all too familiar with. 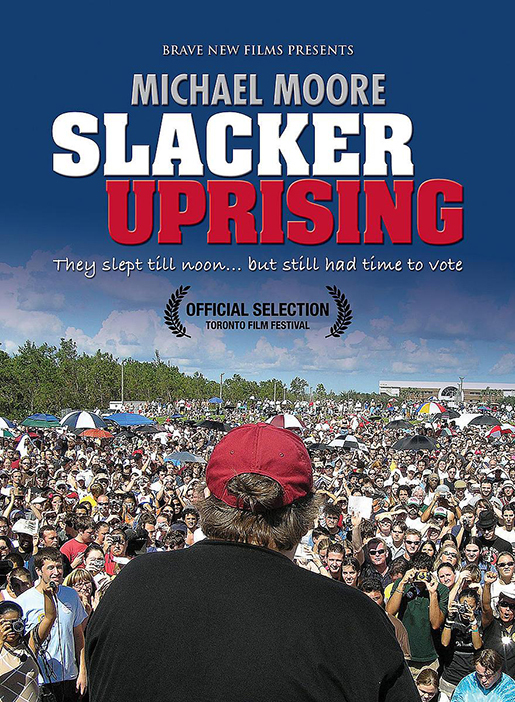 Moore has made an imprint in movie history by making his Slacker Uprising available for free on the Internet for North Americans. The point of this exercise is to energize the American public to turn out their own votes, electing the Democratic nominee in a landslide, thus keep the Republicans at bay while we clean up the mess they’ve made. That’s all Moore cares about now. With my headphones on in front of my Mac computer, I was bobbing my head to the beat of the guitar-raging montages of Moore traveling from state to state and being greeted by thousands of attendants cheering their throats dry. If I went the extra 136 miles, then I could have attended this “concert film” with an American audience sans the National Guard Join The Army promos. It just isn’t the same in Canada. The film begins with a mournful rendition of When Johnny Goes Marching Home as clips of the Best of Kerry vs. Bush Campaign carries on. That same ominous diddy was used throughout the virtuoso Fort Knox robbery sequence in Die Hard with a Vengeance (1995). 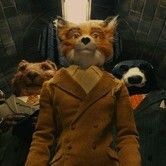 The two independent scenes still carry an undertone of thievery. There are also some hilarious faux television spots that satirize the Republican’s sleazy Swift Boat Veterans Attacks on Kerry (“He was only shot three times!”) Moore takes aim at the Bush administration and so-called liberal-media, taking them to task for not informing us about lies that led to invading Iraq back in 2003. I was also reminded of a complaint by independent filmmaker giant John Sayles that everything exposed by Moore’s Fahrenheit 9/11 (2004) should have been done on the evening news. At Moore’s sold-out shows, sometimes he has a celebrity guest like Eddie Vedder, Monkey Bowl, Steve Earle and Tom Morello perform a patriotic and activist song for the audience. This is also the first film to finish up with a stand-up routine by Rosanne Barr, a comic with acidic wit here. The Right claims they God Almighty on their side, but the Left has a greater power, Viggo Mortensen. My personal favourite is Joan Baez who sings Jean Sibelius’ Finlandia, which brings back memories of her heart-stopping performance of Swing Low, Sweet Chariotin another documented concert that cried for peace, Woodstock (1970). When approached by fans, Moore even has the class to deny buxom woman’s request to autograph her chest – an item I pray no one ever considers putting on Ebay. Things really pick up when American soldiers speak out against their president and his war. There are echoes from Fahrenheit 9/11: “(These Soldiers) gave their lives so we can be free. Will they ever trust us again?” A solemn tribute is made when Moore visits Fort Kent State in Ohio where the national guard opened fire and killed four out of many protesting students against the Vietnam War on May 1970. 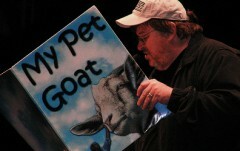 Make what you will of Michael Moore: Truth Seeker. Muckraker. Anti-Christ. Why so many people not in the richest one-percent of the country up chuck such venom when encountered by Moore is a sad commentary. They scapegoat the filmmaker in the baseball cap who voices outrage over the continued exploitation of the poor. After all the feces the Right-Wing have been flinging at Moore, can you blame him for including so many testimonials from people around the country who treasure the big guy. Sure, he can be a showboat who soaks in the love. Here we are in 2008 and this time Moore doesn’t have to hand out clean underwear and microwavable noodles to get would-be voters’ attention turned toward exercising their own democracy. Slacker Uprising may not be Oscar worthy like Moore’s call-out for free health care for all United States citizens, Sicko (2007). I may be steered otherwise when I see Barack Obama get sworn in as President of the Unted States next January. Can you question his sincerity after watching this? From the Michael Wadleigh documentary WOODSTOCK (1970). Barack Obama won the presidency tonight! Congratulations to all who voted.